No Matter What Bath Time Throws Your Way. Just Spray & Rinse It Away. As if he wasn't even there. Wet & Forget Indoor Cleans & Deodorizes. It Makes Other Cleans Look Dirty. Spiders Gone As Quickly As They Came. Need A Cleaning Job Made Easier? Find the right Wet & Forget product for the job. Outside or indoors, the entire line of Wet & Forget products make your toughest cleaning jobs easy while providing superior results. What Do Wet & Forget Customers Say? Read Their Reviews. Wet & Forget customers are excited with the results they experience because Wet & Forget works! See what they have to say. Gary Sullivan | Host of the radio show: At Home with Gary Sullivan. I love talking about Wet & Forget Outdoor to my listeners because it works and is so easy to use. The feedback I receive is always, 'I can't believe how easy it was to use and IT WORKS!'. It's my go-to product for cleaning up a homes' exterior. Need Cleaning Tips or DIY Ideas? Wet & Forget Videos Are Here To Help You! We walk you through, step-by-step applications and tips for all of our Wet & Forget products. We even provide you with DIY projects and ideas for making your house a home. 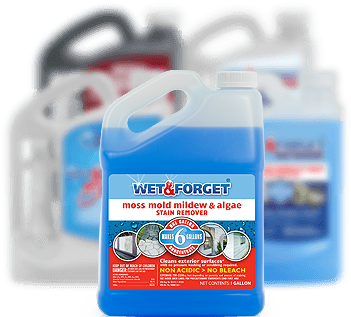 Learn about the entire range of Wet & Forget products. See how Wet & Forget Hose End dramatically simplifies difficult roof cleaning tasks. Wet & Forget Shower takes the back-breaking labor out of daily shower cleaning with it's once-a-week, no-scrub application.